A detailed study of the rise to power of China’s dominant leader. In 1989, just before the debacle of the Tiananmen Massacre was to occur, Deng Xiaoping picked from seemingly nowhere an owl-faced, bespectacled man to lead China’s ruling Communist Party. This man, Jiang Zemin, went on to head not only the party, but China’s state and military apparatus as well. 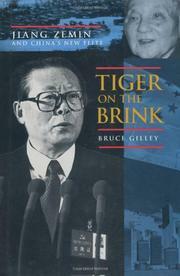 Gilley, Hong Kong correspondent for the Far Eastern Economic Review, argues in this fascinating biography that Jiang’s rise was no accident, that he was, rather, the right man (and Chinese politics remains a man’s club) at the historically right time to lead China. Born in Yangzhou, a city near Shanghai, in 1926, Jiang at 72 is a relatively young man in the aged world of Chinese leadership. He rose steadily if unspectacularly in the party bureaucracy, mostly in Shanghai, and in the byzantine setting of factional strife that was the China of Mao Zedong, he learned the art of political caution, accommodation, and leading by consensus-building. He did not create, as did other leaders, “a private kingdom” within the party that was at once a power base and also vulnerable to attack. While Jiang had few ardent supporters, he also had few enemies. Once Deng picked him for greatness, he was generally acceptable to all power bases within the party. He has been able to expand his power by slowly winning influence over, rather than attacking and destroying, as in the past, those who oppose him. Jiang is no “emperor” in the mold of Mao or Deng, nor, Gilley explains, is such an autocratic style of leadership possible any longer in China; while China is certainly not a democracy, certain checks on the authority of even the top leaders do exist. Within this setting, Jiang has attempted, with success, to combine social stability with rapid economic growth. A well-crafted if overly long work that adds much to our understanding of the politics of modern China.